The formula for Sean "P. Diddy" Combs' success as a "solo" artist is simple: value your family. Although he had outside help from friends such as Ginuwine, Twista and Foxy Brown on his solo debut, 1997's No Way Out, it was then-Bad Boys Mase, Notorious B.I.G. and the LOX who dominated the album's tracks. Like a movie director making a cameo in his own film, Combs was more of an organizer, giving his young protégés a chance to get their shine on while he dropped a verse or two on each track. After being acquitted on charges of bribery and gun possession in a closely watched trial earlier this year, P. Diddy is reborn on his just- released third album, P. Diddy & the Bad Boy Family — The Saga Continues ... On it, P.D. flaunts his rebuilt roster of hungry young rhyme gladiators and hints that his struggles have made him a different man. Although it's going be difficult to duplicate Bad Boy's incredible 1994-97 run of hits, P.D. 's latest single, "Bad Boy for Life," proclaims he's up to the challenge. As he told MTV News' Sway, he's rested, rejuvenated and ready to retake his throne. Just don't expect him to be rocking that shiny suit again. Sway: Last time we talked it was right after the trial, and you told me you were going to some time off, maybe six months. You were going to see the world, find yourself, then come back. What happened? P. Diddy: It happened, [but] in a shorter time. I've never really taken more than four days off, so it was a lot for me to go away for three and a half months. I went all over Europe. I walked on a whole bunch of beaches and I did a lot of thinking. I spent a lot of time in Miami. [A] couple of illegal lane changes here and there. [Laughs] At night I would get a little bored. I'm hyperactive, and I went in the studio and I would just start making records, for no reason. I haven't had the chance to make music for a year and a half. A couple people started knocking on my door ... all the artists [on my label] I was neglecting my whole trial period. Hanging out turned into us making records together. Then we got 10 songs ... and we was like, "Hold up, we got a little album here." We were going to put out a compilation album, [with] individual cuts from each artist. But after I had this album finished, I said, "I'm going to keep "Let's Get it" and the Faith [Evans]/Carl [Thomas] joint ["Can't Believe"]. ... And I'm gonna put those two on the album with these cuts that I did. I'm just gonna throw out something for the summer". Sway: What is the theme of the album? P. Diddy: If you're looking for a deep album or you're looking for me to talk about past situations, it's not even about that. It's just 14 hot records that are gonna make you dance. Everybody's just been spilling their guts all over records and talking about how hard it is to be an entertainer and how much we get hated on and what we have to go through. But I ain't really got it that bad. I'm just happy to be here. Sway: On your new single, "Bad Boy for Life," you make reference to how influential Bad Boy has been in hip-hop. How do you think Bad Boy has influenced the music industry? 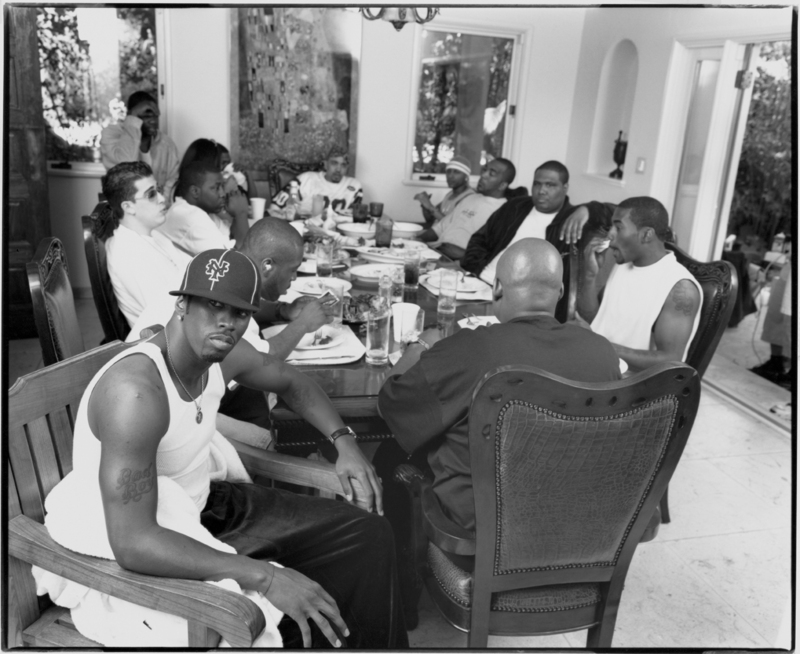 P. Diddy: You go into any club in the U.S. and you're gonna hear at least 30% of music with some Bad Boy involvement. We are proud to be the team [that] weathered the storm. [We were] hated on, then loved, then hated on. But we are still here. You can always guarantee on us to hit you with a hot record. Sway: I know on the album you made comments to people who called you the "Shiny Suit Guy." 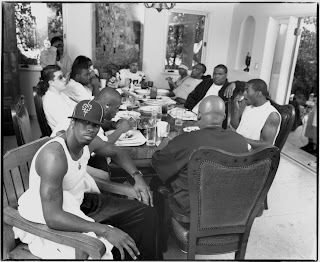 P. Diddy: You all remember when Bad Boy put on a big tour [in 1997] and me and Mase had on the silver shiny suits? Then, six months later, [I would see] friends of mine, friends [in] the industry on MTV. They would be like, "We ain't no shiny suit rappers." But they never said, "Yo, Puff with the shiny suit." They never said my name. I was the one they were talking about. So I made a little interlude [on the album] about it. I just confessed that I was Shiny Suit Man, and it was all in fun. There wasn't any anger involved. Sway: Are you still going to come out in shiny suits? P. Diddy: No, no, no. Sway: Your whole style seems to have changed. P. Diddy: The shiny suit was just a costume. I don't want to go see nobody just standing there in a T-shirt, not moving on stage. When you go see a lot of hip-hop shows, a lot of times people don't put costumes into the show. We would do six costume changes, because we are there to entertain. [If] somebody [is] paying $40 for a ticket, you better put on a shiny suit or something. Forty dollars and a white T-shirt? Come on, man! But the shiny suit is retired. Sway: Is it in the closet somewhere? P. Diddy: It's in the Hip-Hop Hall of Fame, and there is one in the Rock and Roll Hall of Fame. It's retired and that's why we can make fun of it. It's [like] when you make fun of somebody for wearing bell-bottoms. It was cool at that time, and [when] we put it on people liked it. Then a year later, it was played out. Sway: The New York Daily News recently did an article based on a TALK magazine piece that alleges that you are withholding information about Biggie's murder as well as information on other murders. How do you respond to that? P. Diddy: First of all, it hurts. It hurts me to my heart that somebody could say something as ridiculous as that. I would never withhold information about the murder of my man Biggie, or anybody else. It's just silly and ridiculous. The accusations are just flying out. All I've been trying to do all my life is to make great music. I'm in the studio 24 hours a day. It's true that once you get a certain level of success, you become a target. TALK magazine should be ashamed of themselves. We're working on a lawsuit with them right now because it has to stop. Sway: Russell Simmons' recent hip-hop summit had a theme of hip-hop artists taking more responsibility for their actions and lyrics. Do you feel the summit has affected your music? P. Diddy: I was already on that plane, because me and Russell were having discussions. This is my 10-year anniversary producing, making music, and ... you're not what you were 10 years ago. It's just a natural evolution and having wisdom. I think that's what the conference was about, sharing our experiences and what we learn[ed] from all the things we went through. On the new album, I didn't plan it that way, but I probably said one curse word. It just was a frame of mind, the place I'm in. I just want to put positive energy out there. I'm not saying a curse word is putting out negative energy, but it depends what mood you're in. If you're in an angry mood, that's the kind of music you're going to make. But ... I just wanted to make people dance. Sway: Will that affect the kinds of artists you sign to Bad Boy? P. Diddy: Yeah. I'm not going to sign cats just trying to compete with Jay-Z, or [artists] trying to live Nas' life. I am not going to sign a 15-year-old kid from the suburbs talking about what Jay-Z is talking about. If there's a kid from Harlem that's going through and seeing all this stuff, I'm gonna definitely let him report what he is seeing. If it's hard, if it's soft, whatever. Sway: Tell me about the gospel album you're working on. P. Diddy: [It] comes out in November. I don't want people to get scared when they hear about gospel. It's really an inspirational album. It's not about religion, it's just [about] spirituality and being positive and giving thanks. It's important for us as artists to let kids know that, yeah, you can listen to Biggie and Tupac, but you always have to remember who has to come first in your life, and that's God. All the money goes to an AIDS in Africa [charity] organization. There's a huge AIDS epidemic in Africa, and [one of] Bad Boys' [plans] this year is to give more awareness to that. We're gonna be doing a big charity concert helping to save some of the brothers and sisters in Africa. We have Kirk Franklin, Mary Mary, Faith, 112, Joe, Brandy and Brian McKnight [on the album]. I rap on one song with Fred Hammond, who's a gospel legend. I produced the album. Sway: Do you feel a certain amount of pressure putting out an album about God? When you go back out on the streets, do you feel you have to watch how you act and what you say now? P. Diddy: I think that's good that I have to watch how I act and what I say. I think that's a part of growing up. Sway: Former Bad Boy artist Mase is now a minister. Did you ever consider putting him on the album? P. Diddy: He doesn't want to perform anymore. It was something that we considered, but we hadn't worked [with] him on this even when he was signed to the label. We had a song [that featured] him called "I Love Him." But we took him off because he said he didn't want to be a musical performer, whether it was gospel or hip-hop. Sway: Rumor has it Mase is writing a tell-all book about his experiences with Bad Boy. What do you think about that? P. Diddy: I think it can be nothing but positive. I feel he would tell the truth. I don't feel he would sensationalize anything. We don't have nothing to hide. If he wants to write a book, we fully support him. Sway: You formed the Three The ... clique with G-Dep and Black Rob. What's up with that project? P. Diddy: We'll probably do something with that after G-Dep's album [and] after Black Rob's album sometime next year. Sway: Talk about your role in the movie Made. P. Diddy: Made is a movie with Jon Favreau and Vince Vaughn ("Swingers"). When I decided I wanted to be an actor, I said I wanted to work with quality actors and directors. A lot of times you have those [elements] together on independent films. So I said I'm gonna start out making no money, changing my clothes in the middle of the street, no makeup artists, straight raw. They're [Favreau and Vaughn] two fish-out-of-water [guys] that come to New York trying to get their hustle on. Sway: There are rumors that you're doing another movie with some big actors. You want to speak on that? P. Diddy: I already did my second film. It's called "Monster's Ball." We've got Billy Bob Thornton, Heath Ledger and Halle Berry [in it].